Hot sticks are poles made of an insulating material. They have tools and/or fittings on the ends which allow workers to manipulate energized conductors and equipment from a safe distance. 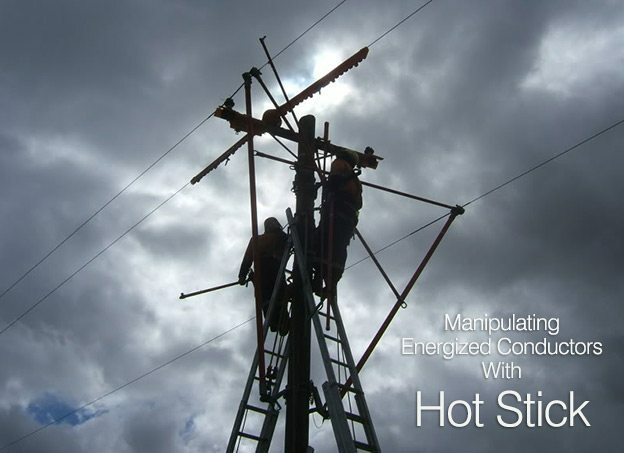 Hot sticks vary in length depending on the voltage level of the energized equipment and the work to be performed. Modern hot sticks are made of fiberglass and/or epoxiglass. Older designs were made of wood which was treated and painted with chemical-, moisture-, and temperature- resistant materials. Figure 1 is an example of a simple hot stick fitted with a tool suitable for operation of open-air disconnect switches. Hot sticks can be fitted with a variety of tools and instruments. The most common fitting is the NEMA standard design shown in Fig. 2 as the standard universal fitting. 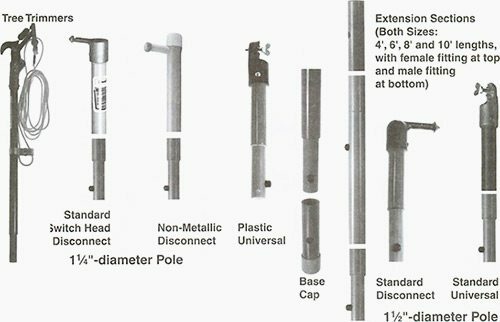 This fitting allows a variety of tools and equipment to be connected to the hot stick. Figure 2 also shows other attachments and extensions that can be used to increase the usefulness of hot sticks. In addition to the equipment, hot sticks can also be equipped with: wrenches, sockets, screwdrivers, cutters, saws and other such tools. Hot sticks can also be seen in telescoping (Figure 3) and so-called shotgun models (Figure 4). The telescoping type of hot stick is composed of several hollow, tubular sections which nest inside of each other. The topmost section is first extended and locked in place by means of a spring-loaded button which snaps into a hole. The user of the hot stick extends as many of the sections as are required to accomplish the job at hand. The telescoping hot stick makes very long hot stick lengths available which then collapse to a small, easy-tocarry assembly. The shotgun hot stick (Figure 4) has a sliding lever mechanism that allows the user to open and close a clamping hook mechanism at the end. In this way the user can attach the stick to a disconnect ring and then close it. After the switch is operated, the shotgun mechanism is operated to open the hook. The shotgun stick gets its name from its similarity to the pump-action shotgun. 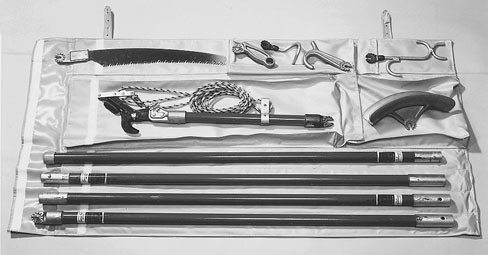 Figure 5 shows a hot stick kit with several sections and various tools. This type of package provides a variety of configurations which will satisfy most of the day-to-day needs for the electrician and the overhead line worker. Electricians involved primarily in indoor work might wish to substitute other tools for the tree trimming and pruning attachments. When to Use Hot Stick? Hot stick should be used to insulate and isolate the electrician from the possibility of electric shock, arc, or blast. The specifics of hot stick use will depend upon the task being performed and the location in which the worker is positioned. As a general rule, if hot sticks are being used, the worker should also wear other protective clothing. At a minimum, rubber gloves and face shields should be employed. However, many recommend that flash suits should also be worn, especially when safety grounds are being applied. Before each use the hot stick should be closely inspected for signs of physical damage which may affect its insulating ability. If the hot stick is cracked, split, or otherwise damaged, it should be taken out of service. ASTM Standard F 711 requires that manufacturers test hot sticks to very stringent standards before they are sold. Additionally, OSHA standards require that hot sticks be inspected and/or tested periodically.